PIPE BEVELING MACHINE HANDLES SUPER ALLOY PIPE UP TO 8.625” O.D. A portable, I.D. clamping pipe beveller that is easy to operate and can bevel, face, and bore a broad range of pipe schedules using one mandrel and eight sets of clamps is available from Esco Tool of Holliston, Massachusetts. The Prepzilla MILLHOG® I.D. Clamping End Prep Tool provides a single point of attachment for pipe from 1.575” I.D. to 8.625” O.D. using one mandrel and eight sets of interchangeable clamps. Capable of beveling, facing, boring, and squaring pipe in a single operation, this portable pipe beveller is ideal for Super Duplex stainless steel, P-91, and other hard super alloys. Featuring cutting blades that transfer heat away from the pipe surface, the Prepzilla MILLHOG® I.D. Clamping End Prep Tool utilizes the secure EscoLock™ blade lock system and requires no cutting oils. 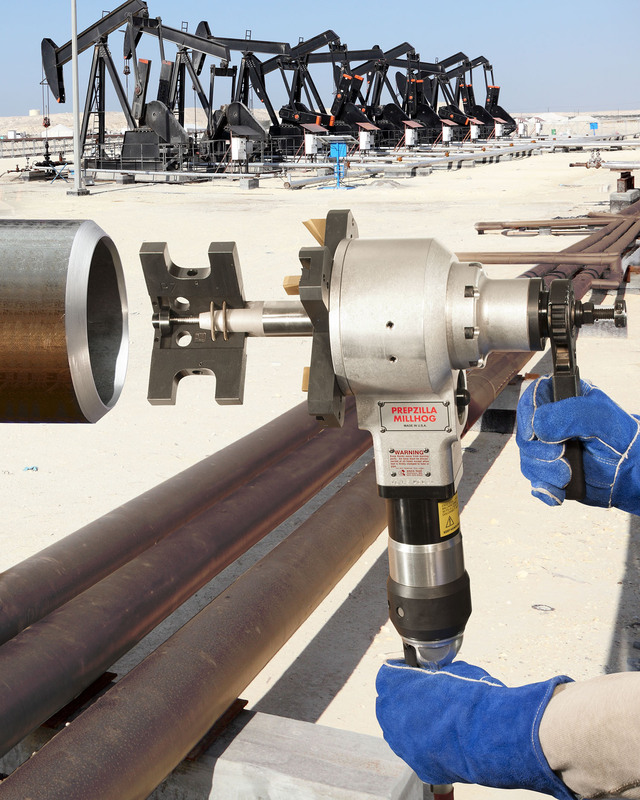 Built for tough oil field applications, all clamping components and internal operating parts are hardened, heat treated, and ground to provide a long service life. The Prepzilla MILLHOG® I.D. Clamping End Prep Tool sells for $9,450.00 and can be rented for $371.00 per week.